Sunwing Vacations offers value-added holiday packages from Canada to the Caribbean, Central America, Mexico, Europe, and the US. Based in Toronto, ON, the integrated leisure tour operator offers: all-inclusive vacation packages, leisure flights, group travel, and hotel and car rental deals. 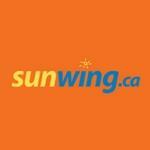 Sunwing Vacations is a full service airline providing high frills leisure class service at a low cost. Products Carried: Sunwing Vacations is an integrated leisure tour operator based in Toronto, ON. A family-operated business since 2002, Sunwing Vacations offers a range of vacation packages, leisure flights, group travel, and hotel and car rental deals, at affordable prices.